Get through day in comfort and style with a pair of the 24-7 Series 65/35 Polyester Cotton Teflon Coated Pants from Tru-Spec. Featuring a tough all-weather construction, the pants are ideal for everything from tactical missions to longs days at the office, and everywhere in between. Their unique blend of cotton and polyester creates tough yet breathable shell that feels great in any environment. Deep front pockets and knife accessory slots offer convenient item carry and quick access. Two additional pouches are sized to carry phones and magazines depending on where the day leads. A comfort driven waistband flexes with the body for all-day comfort regardless of activity levels. 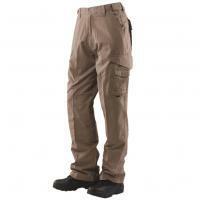 To add to its tactical functionality, the pants feature internal knee pockets for pad integration. I like the pants this is my fourth pair I like him they wear well and they're very comfortable. As advertised. Fit perfectly. Comfortable, durable and functional while looking good enough for off duty wear. Like that even the back pockets are secured with flap and hook and loop. I rate these pants a firm 4 star. They have plenty of pockets, comfortable in all weather temperatures. My only complaints are the one's I was issued were just a S,M,L sizes. I'm a solid 32W and the size S are very tight in the waist, especially on the hip. The size S feels more like a max waist of 28in Size M is better a better waist size, but too long in length. Comfortable and easy to clean. My order was shipped and arrival in a timely manner. These wear great and are perfect for duty or range and keep the color. I do like the expandable sides as I am an in-between size and they fit great. Will order more like I did with these when the time arises. Excellent pair of pants. I like them so much I bought 5 pairs. Very comfortable with lots of pockets for everyday use, very light, breathable and quality material. However, some pants may have minor defects like, snap button loose or Velcro not sticking properly. Consistently great high quality pants, highly recommend this 24-7 series type of pant, much better quality-design than most military style BDU fatigue pants. I really like these pants. Nice fit and stains wash right out. Great feeling and wear slightly big in the legs (but I attribute that to build). Relax more as they are worn, but can see myself order more when needed. Great duty wear as well as casual time too. Comfortable and great price Fast shipping, will buy again. They are better than advertised. Well made a little water proof. Fit very well. The perfect length. Both of which i asked for. I would recommend these pants to anyone especially a business. Thank you, oh and a good deal. Very comfortable working in these pants. Plenty of room to carry everything and more. The only issue with them that is really not an issue is when kneeling they leg does not simply slide with the bend, I have to pull them up just a bit. Other than that I love them and will be purchasing more pairs to cover the entire week. I love these pants so much that I purchased them for off duty wear ad well.